Boy missing for 4 years found alive hidden behind fake wall. After four years mother and son reunited. Further heartbreaking details have emerged about the boy found hidden behind a fake wall in his father’s house in Atlanta, Georgia. Police say the little boy managed to engineer his own escape by Facebook friend-requesting his mother after enduring years of mistreatment, Gawker reports. The clever boy connected a mobile phone to a wifi network, then he downloaded an app that allowed him to make calls via wifi. He then began planning his escape with his mother and sister, police say. In other shocking news, the stepmother is reportedly on probation for cutting her own child’s tongue with a pair of hot scissors in 2004 because he talked back to her. For four years this boy’s mother had no idea where her son was. For four years she searched. Of not knowing. Four long years. It is difficult to even imagine the deep aching loss. Until the boy, now aged thirteen was found hidden behind a false wall in the home of his father. 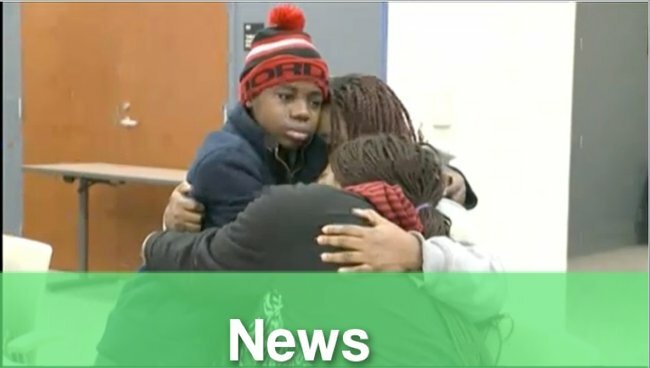 The boy, unnamed by US media, was reunited with his mother over the weekend. And just look at this. The moment this mother was reunited with her son. The events unfolded over the weekend in the US city of Atlanta, Georgia. Four people living in the home in which he was found were taken into custody including the boy’s father, Gregory Jean, 37, and an adult female, said Sgt Kevin Hughes of the Clayton County police. WSB-TV reports that the boy’s mother had reported him missing to child welfare authorities four years ago but not to police so no missing person’s report was filed, possibly as she was an immigrant to the US and unfamiliar with the necessary procedures. He went missing in 2010 while visiting his father in Florida. The boy was found hidden behind a fake wall in a linen closet in his father’s house. It is unclear how often he was hidden inside the fake wall. WSB-TV reports that when police found him and asked him to come forward “he was horrified. He was frozen with fear.” Clayton County Police Sgt. Joanne Sutherland said. Authorities had been alerted to the boy’s whereabouts after he had managed to recently text his mother after downloading a phone app. She then called the police. The boy’s father and step-mother have been arrested. Police said the boy repeatedly thanked the officers who found him. The boy, just 13-years old is currently with child custody officers. We can only wish him and his mother the very best for their future.